Kinnara Bugaku/Gagaku Japanese court musicians and dancers. For the centennial year of the cherry trees gifted to the United States from Japan, the Japanese American Cultural and Community Center is celebrating its first annual “Spring Festival: LA Bloom”— a new season, showcasing timeless traditions, contemporary art, culture, performances and community activities. 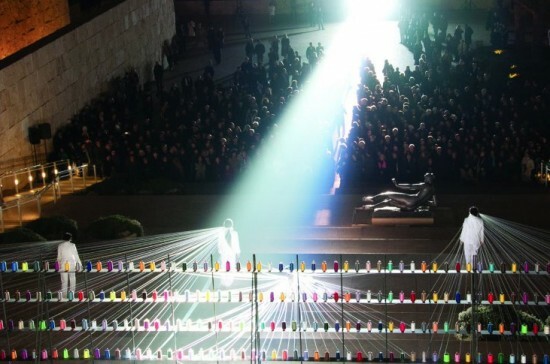 The nine-day celebration will begin with an opening night performance, “Mare Nubium,” on Friday, April 27, and ends with the Family Day on Saturday, May 5, and features a transformation of the JACCC Plaza into an ecoartspace. • JACCC Artistic Director Hirokazu Kosaka and Co-curator Calvin Abe will transform the plaza into one of the world’s largest Zen gardens with over 5 million pebbles raked to create puddles of raindrops. Kosaka’s thoughts on the raindrops: “In 1852, footprints of a boy were found fossilized in a clay stone on the east bank of the Connecticut River in Massachusetts. Also preserved in the clay were tracks of birds, animals and snails. Even impressions of raindrops were preserved. Vocalist Mia Doi Todd and pianist Motoko Honda. • The James Irvine Japanese Garden will be transformed into a large-scale, sculptural and soundworks installation by ikebana artist Yokou Kitajima and Academy Award-winning sound artist Yuval Ron. • The George J. Doizaki Gallery will feature an ikebana exhibition by the Eika Fukui Group of the Sogetsu School of Flower Arrangement. • Taiko Center of Los Angeles will bring its powerfully visual art form that combines traditional Japanese rhythms and contemporary Western and world rhythms to the JACCC Plaza on Saturday, April 28, at 1 p.m. The center was founded in 1996 by director Rev. 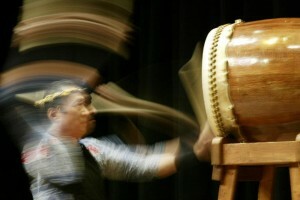 Tom Kurai to preserve the art of taiko drumming. • The On the Veranda Lecture Series on Sunday, April 29, brings an afternoon conversation between Hiromi Paper International and LACMA conservationists. The audience will be introduced to fine-art paper and artisans from the world of papermaking in washi and youshi — Japanese paper and Western paper. • Tuesday Night Café on Tuesday, May 1, from 7:15 to 10 p.m. on the JACCC Plaza is one of the longest-running free public art series in Los Angeles, with performance art, music, poetry, visual art, short film, and an eclectic array of Los Angeles performers and community members in Little Tokyo. • Jazz Night on Thursday, May 3, in the JACCC Aratani/Japan America Theatre, opening with a performance by vocalist Mia Doi Todd and closing with avant-garde jazz pianist Motoko Honda and her ensemble quartet. 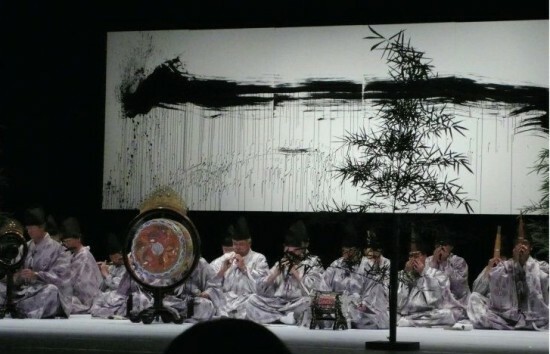 • Japanese court musicians and dancers Kinnara Bugaku/Gagaku will be performing live in the JACCC Aratani/Japan America Theatre on Friday, May 4. The show will also include the Arpana Dance Company performing its Bharata Natyam repertoire and collaboration to a rhythmic sequence by Kinnara Taiko. • Family Day on Saturday, May 5, will have live performances, community activities and workshops for all ages on the JACCC Plaza. 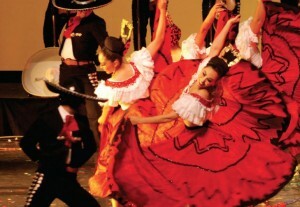 • Cinco de Mayo performance by Pacifico Dance Company on Saturday, May 5, at 8 p.m. in the JACCC Aratani/Japan America Theatre. Pacifico Dance Company presents spectacular performances of Mexican folklorico dances that combine the essence of traditional styles with modern dance idioms. Pacifico Dance Company is a leading international dance company based in Los Angeles under the direction of Adriana Astorga-Gainey. The JACCC is located at 244 S. San Pedro St. (between Second and Third streets) in Los Angeles. For the complete schedule and ticket information, visit www.jaccc.org.